Dave Shoemaker, third generation owner of Shoemaker's Travel Center stepped away from his busy schedule to speak with me about the family business. He also shares a few details into the history behind their well-known memorabilia, displayed throughout the 5,000 square feet of store space. Dave and his wife, Karen relocated Shoemaker's directly across the street from the old store, in turn providing us with a much larger collection of notable relics of the past. 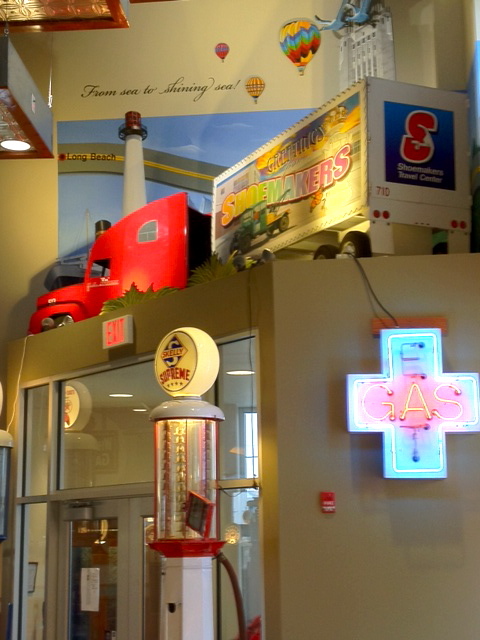 Shoemaker's Travel Center is more than your average truck stop. The list of amenities is for the whole family! Catering to truck drivers is a full-service center open 7 days a week, lots of private parking available, easy access from the interstate and plenty of gas pumps. Families can dine-in or carry-out at the restaurant and shop for games, electronics, or novelty clothing. Their second location is less than 15 miles away on Hwy 77 and Saltillo Rd. With the same rustic atmosphere and stunning murals painted at both stores, the Shoemakers have paved the traveler's journey with a bit more antiquity, reminding us of the olden days. M: How did your family initially get into the service station business? D: My grandfather, Harley C. Shoemaker loaded all the family's belongings in to a semi and moved out to California, not knowing what they were going to do. They didn't see a future in farming, so in 1951 they basically traded the truck for a truck stop that had 3 pumps. My dad, Harley G. Shoemaker was in his mid-20's when he joined in. He was just out of the service and didn't have an interest in it, because he had already done the gas station business and didn't like it. But my grandfather said that it's what he should do, so he did. There was also his two brothers Don and Roger, that joined later on. I'm glad that he did! It's been good to us through all these years. We've certainly met a lot of good people. M: Lincoln, Nebraska has been your home for 50 years now. How did the Shoemakers end up there? being built and at this location he figured the interstate wouldn't go around us for a long time. The truck stop was originally a Skelly truck stop with several locations. He thought it was a good brand to go with. Plus, he was from Illinois and liked the farm community and the Midwest area. It was nice to come back to that. M: At what age, did you get involved with the store? D: I started pulling nails for my dad at 6 or 7 years old. M: The oddities exhibited at Shoemaker's are full of character. Bright and charming, all very interesting. Where do you find most of your primitive décor, featured throughout the store? D: Dad started out with one pump. It's a red, Clock face, Tokheim with a gold crown on top. Once we put that pump in, it was like a magnet. Drivers and customers got involved. People brought us everything from pictures and globes, to different types of signs. It all just surprised us! Some drivers would come in with stuff packed away in their sleepers that they had been hanging on to until they got here. Oil cans, all kind of stuff. It's been a fun ride! 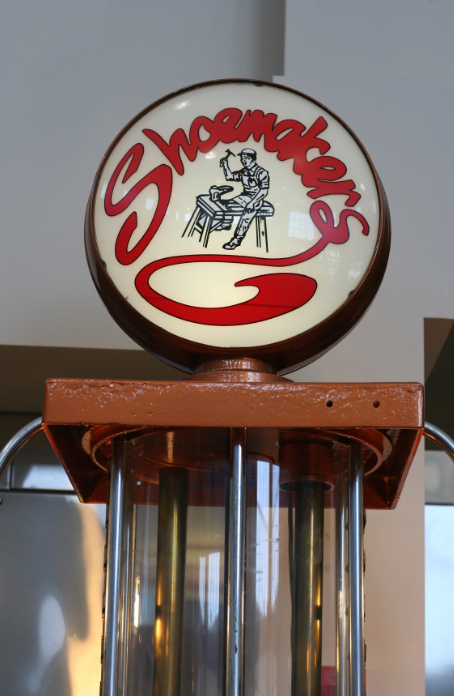 M: What is one thing that you would like each visitor to remember about Shoemaker's, aside from the memorable antiques? D: That we are a family owned business. We are here all the time. My son, Ryan has now started working with me here. He will be the fourth generation. And my daughter, Raina is finishing up school and is very interested in the business also. So, they both would like to get into it. M: I've heard great things about the restaurant. What would you recommend ordering off the menu? D: I'd recommend the pork tenderloin and our corn beef Rueben is good too. Or anything with bacon... I think we have the best bacon around. It's sliced thick and everyone seems to like it. D: My dad had a Jeep Wagoneer and pulled an Airstream trailer with it. When he would go on vacation, there was no telling what he'd bring back. 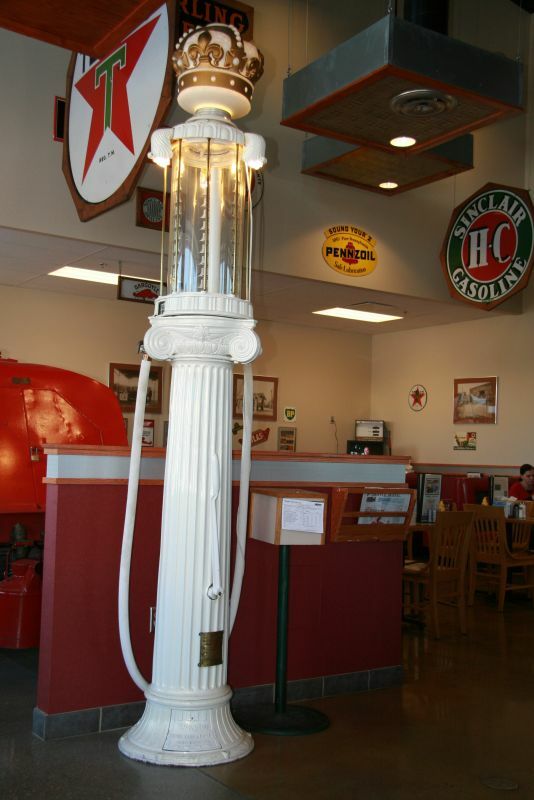 Back when the Missouri flooded about 10 or 15 years ago, it washed out part of an area and a gentleman just north of Omaha found that white Wayne Roman Column gas pump. He saw it and began to dig it out. At first, he thought it was a light pole. My dad really wanted it. The man later came to Lincoln because he knew we had other pumps and was interested in restoring it. So, my dad helped him out with parts, and about one month into it the guy asked my dad if he wanted to buy it. He was so excited! He went up there with his old two-wheel trailer and came back with this big smile on his face. It was just this rusted mess... I was like, you taught me to be frugal all my life and you spend that kind of money and come back with this. He had this ear to ear grin like, YEP! We started working on it and putting it together. It turned out beautiful! It's now sort of our trademark pump. Most of our pumps have a story to go with them. M: Shoemaker's Travel Center is a well-established truck stop that offers a family-friendly atmosphere. On top of the unique appeal and good food, what else can we expect to see when we walk in? state. For instance you can find Dorothy and Toto sitting on the porch in Kansas! We also have 3 Cushman motorcycles inside that were built here in Lincoln. We have antique trucks: One Patriot, which was built here too. A Douglas, that was built up in Omaha. And an International tank wagon that came from down the road. The biggest thing is when people walk in the front door and watching them look around; when they look up and seeing their jaws drop and begin pointing in different directions, all of that is cool to see. When people bring their friends and relatives in to visit, that's cool too. When drivers say, 'I've been there...' or 'I remember this...' that's really fun! Find them on Facebook under, Shoemakers' Travel Center.